'Chunky' is a gorgeous premium British made Baker's Twine, The 'chunky' range is a thicker alternative to the standard baker's twine. A 4mm diameter chunky cotton craft twine is made from 100% natural soft cotton and presented on a recycled cardboard spool. Its nostalgic colourful charm means it looks great for whatever it is use.The bakers twine are available in range of spool sizes. Thick Bakers Twine - Beefeater Red and White. 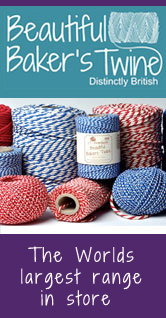 Thick Bakers Twine is a thicker, chunkier alternative to the standard diameter of the original red and white candy Beefeater Bakers Twine. 4mm Diameter chunky twine manufactured in a luxury soft cotton craft twine. Please select your length from the drop down box below. 4mm x 10m Premium British made Chunky Baker's Twine - Original Sky Blue. A thicker alternative to the standard baker's twine. 4mm x 10m Premium British made Chunky Baker's Twine - Original Spring Green. 4mm x 10m Premium British made Chunky Baker's Twine - Original Tangerine. 4mm x 10m Premium British made Chunky Baker's Twine - Original Violet. 4mm x 10m Premium British made Chunky Baker's Twine - Original Daffodil Yellow. 4mm x 10m Premium British made Chunky Baker's Twine - Original Emerald. 4mm x 10m Premium British made Chunky Baker's Twine - Original Highland Heather.